The Guidelines provide expectations for what children should know and be able to do so that everyone who cares for young children can provide learning experiences to prepare children for success in school and life. 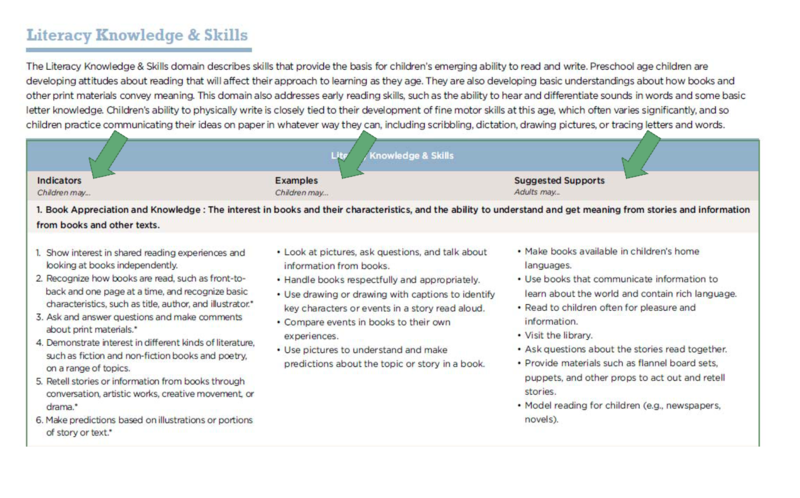 For each age group, sections describe child development by using essential areas of learning called domains. The Guidelines organize descriptions for child development for infants and toddlers within six domains: physical development and health, social development, emotional development, language and literacy development, cognitive development, and approaches to learning. The Guidelines organize descriptions for child development for children age three to five into 11 domains: physical development and health, social and emotional development, English language development, language development, literacy knowledge and skills, logic and reasoning, mathematics knowledge and skills, science knowledge and skills, social studies knowledge and skills, creative arts expression, and approaches to learning. For children ages five through eight, the Guidelines follow the Colorado Academic Standards. Teachers and child care providers should understand that children’s learning will integrate skills across multiple domains. Indicators, which describe typical development and what many children may be able to do at certain ages. Examples of what those indicators may look like. Suggested supports, which describe ways that adults can encourage child development for each indicator. For kindergarten – third grade (5-8 years), consult the Colorado Academic Standards. You can also download the complete Guidelines document.